Bill Gates delivering this year's Richard Dimbleby lecture described the battle to eradicate polio as one of the most difficult tasks the world has ever faced and revealed the fight against the disease was the project he dedicated most of his time to and praised the work of Rotary International. 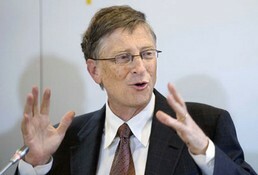 He said:"We are working to wipe the virus off the face of the earth, and we have almost succeeded... Stopping the last cases of polio in these last countries is among the most difficult tasks the world has ever assigned itself. But it is also among the most important...But the virus is stubborn and it is also much harder than I expected...Vaccines are a miracle tool. They prevent disease from striking, which is better than treating it after the fact. They are also relatively cheap and easy to deliver. However, millions and millions of children don't get them. This is still stunning to me..." He explained his optimism for a world free of polio, why he is devoting so much of his time, money and influence to eradicating the debilitating disease and how others can help him achieve his goal. Praising the work of Rotary International he said: "Many organizations helped push the eradication resolution through the World Health Assembly, but the one you wouldn't expect is Rotary International. Rotary is a service organization with 1.2 million members in almost every country in the world, including more than 50,000 in Great Britain and Ireland...Rotarians pledge to put service above self, their motto, but they have no specific global health mandate. They are not polio experts. They are regular people who go to work and spend time with their families. For three decades, they have also spent time advocating for polio eradication, raising money to support vaccination, and giving kids polio drops all over the world." He also said he gets asked two questions. First, given all the challenges, is this really possible? And second, should we bother putting in the work it's going to take? To which he continued:"Yes, we can eradicate polio.... And yes, we should....Why is it worth it? Polio doesn't kill as many people as AIDS, tuberculosis, malaria, or rotavirus. It's not even close. So why should the world focus on eradicating it? There is no such thing, first of all, as keeping polio at its current, low levels. We have gotten to this point because vaccinators are wading through flooded rivers, developing-country governments are investing scarce resources, and the global health community is on high alert. These are not sustainable approaches. If we don't keep investing, cases will shoot back up to the tens of thousands annually in dozens of countries. Second, success will generate lessons that benefit all of global health. We are on the verge of doing something we've never been able to do before—reaching the vast majority of children in the remotest places in the world. We are building systems, developing technology, and training workers that make it possible to help people who never got any help. When polio is gone, we can use the same systems, technology, and people to deliver other lifesaving solutions, especially routine vaccinations for diseases like rotavirus and measles." Concluding he said: "Last month, nine vaccinators in Pakistan were murdered by masked militants at the beginning of a three-day polio campaign. The youngest, a 17-year-old volunteer, received several death threats in the week leading up to the campaign and was forced to move between houses for her safety. She was standing a few feet away from her sister when she was shot and killed. To me, the nihilism behind these coordinated attacks—seeking out goodness to destroy it—is the opposite of what the eradication fight is about. The vaccinators were trying to stop disease and ease suffering so that people they would never meet could have a better life. They are heroes, and there are two ways to memorialize them. The first is to do our best to ensure the safety of those who continue the campaigns. And the second is that we have to finish the task they gave their lives for. I am committed to doing whatever it takes to win this fight... The global polio community has a detailed plan for getting from here to eradication... This plan says that if the world supplies the necessary funds, political commitment, and resolve, we will certify the eradication of polio by 2018... If the world delivers, we will eradicate Polio within six years."